Cool mornings in LA. Me & Buck out on the patio tucked under a blanket. Someone's nose buried in a book. Mug after mug of milky coffee. Later I doze off to the drone of hummingbirds at the feeder. A trip to the nursery. Planting geraniums. Late at night I dip my oars in the water and paddle out to my inspiration book. Through a deep forest with a river running through it. Birds that call back and forth to each other. Fireflies! I am adoring all of your posts with these journals and I am itching to start one of my own ! Anthropologie is probably one of the yummiest catalogs / stores .. ever ! I need a boatload of money to buy all of the things I always pick out but it’s nice to dream and be inspired even if I can’t buy it ! violet dahling for goodness sakes! get yourself over to anthropologie online and order yourself the free catalog. its fabulous! no washing required. Love Anthropologie’s concept but it is ridiculously priced for everything, even sale items. Honestly, how can they charge $80 for a pillowcase with ruffles and a few button called a shirt? It doesn’t even wash well. What is exciting about this store is the use of color and texture, too bad the execution is mere window dressing. That said, I do love to stroll through once in a while. Hmmmm, maybe I can just sign up for the catalog — do they deliver it? Or is is just on line? It sounds like I need that catalog! How cool are those chandeliers, seriously? Somehow I got a free subscription to Martha Stewart Living; wasn’t really interested before, but by golly, there are some pretty pages in that thing. I’m not normally a magazine page tearer-outer (that is TOO a noun! ), but you’ve inspired me to plunder Martha before I toss her out. And I mean that in the most respectful way. I just got my first Anthropologie catalog in the mail–thought I’d use it for some inspiration pages. Oh, wow–gorgeous clothes and bedding–I want!! But, alas, I can only afford the coin purse!! More Journal Bliss. I LOVE your spreads so much. Enjoying peeking over your shoulder and sounds like you are deep into your vacation pleasures. Oh the bliss of cool nights and morning and thoughts of rain. I see by one of your inspiration pages that you got you Anthropologie catalog! Your book is so inspiring! I absolutely love what you are doing with your Smash Books. Can’t wait to get started on mine. Your “before anthropologie” image is a prime example of great “photojournalism”. It made me chuckle aloud. 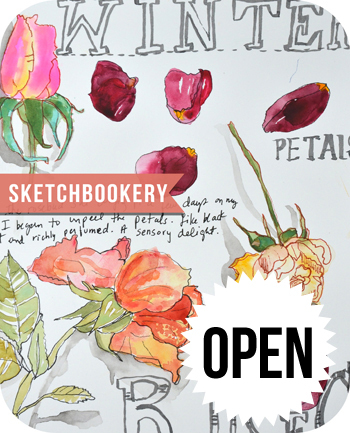 Your new smash journal is simply a fresh contemporary versIon of your visual journal. Your usual humor is here. Your use of color is here. Your view of the world is here. The only difference might be that some images here represent things you can buy. It is as interesting as any journal page of yours I’ve ever viewed. Budapest orange is now in my psyche. You have certainly found an abundance of orange images lately. Watching this smash book develop is a heap of fun. Keep sharing. This chimp is enjoying your new endeavor. oh i am loving your book! and just last night we saw hundreds of fireflies and it was so magical, i am doing a page about it my journal!